Firstie Favorites: Build A Sentence Interactive Word Work!! 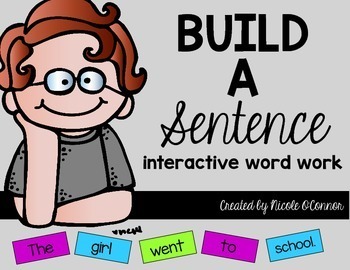 Build A Sentence Interactive Word Work!! Blogging... two days in a row??? It must be spring break! Oh my gosh. I am soooo enjoying a relaxing week at home to catch up on school work, run errands, and binge watch Gilmore Girls. This morning, I started prepping my word work for when I return to school next week. I wanted to come up with a fun activity for students to interact with parts of speech as they are creating sentences and I put together this super simple idea, Build a Sentence Interactive Word Work. Yesterday, on my errands, I picked up this awesome cardstock on sale at Michael's Craft Store.... 3 packs for $10!! Woohoo!! I had lots of fun colors to choose from as I put together this activity today! Then, I cut the cards apart and mixed them together. There are 60 word cards all together. As I began making sample sentences, I realized that 60 word cards may be overwhelming for my firsties when we begin this activity for word work. When I introduce this in my classroom, I plan to start with half the cards and then gradually add in more words in future weeks. Here's a sample of the types of sentences that students can make. I also created a printable to go along with the sentence building cards so that students can write their sentences. We will have to talk about adding uppercase letters to the first word in the sentence and punctuation when we write the sentences... since the cards are all lowercase letters so that the words can be used anywhere in the sentences. And there you have it... a fun, simple, interactive activity! Can't wait to use it with my firsties next week! Enjoy!